Vitus Sentier VR Mountain Bike (SLX 1x11 - 2019) is rated 4.0 out of 5 by 1. 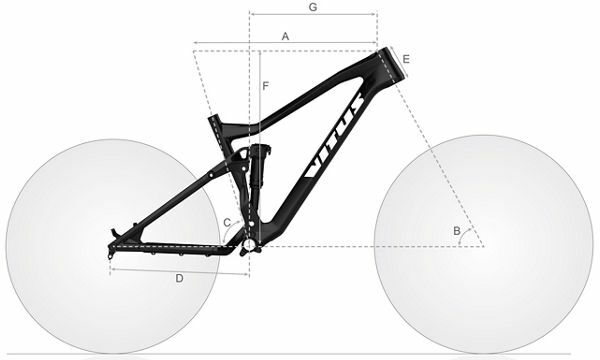 Rated 4 out of 5 by KiwiKross from A lot of bike for the money If this bike came dropper-post equipped, it would really be at the sweetspot for specification versus price. That was easily enough fixed with a Brand-X post ordered at the same time as the bike. That was really easy to fit thanks to the removable lower bung on the downtube for the internal cable routing. While the colour-scheme is rather uninspiring, all you really see is the metallic grey top tube while you're riding it, so I an live with that. So far I've used it on sandy bike park trails, muddy forest tracks and some rocky and rooty technical XC trails, but those were bone dry. The tyres offer really impressive amounts of grip, the gear range is spot on (although I might be tempted to put a 34T chainring on when it eventually wears out) and the forks, gears and brakes all seem to work perfectly, the gear setup being spot on straight out of the box. Nice little touches are the fitting of tubeless rim tape and inclusion of tubeless valves with the bike, along with a couple of bottles of touch up paint. Hello, I have to disagree with the answer another user left, the Rockshox Sektor RL is actually an air-sprung suspension. Cheers! i am planning to install a dropper post once i get the bike but cant find the diameter of the seat post to understand which dropper post should i take. I am 178cm tall with an inside leg of 87 cm. Should I go for a large? I would suggest the large in this bike. We can confirm this comes with a standard set of flat pedals We hope this helps! What are the complementary bike tools that are included? I received a X-Tool multi-tool with straight and Phillips screwdrivers, a T25 Torx and 8, 6, 5, 4, 3, 2.5 and 2mm hex keys (search Wiggle for X-Tools Essential 10 in 1 Folding Multi too). Also a 15mm pedal spanner that is basic but more than up to the job. It was enough to let me build the bike in the office where I had it delivered and ride it home. i am planning to buy this bike along with a dropper post. Will it accept a 150mm dropper post or at least a 125mm? We can confirm the 125mm would be suitable. We hope this helps! Does this bike have internal routing for a dropper post and is it compatible with a cable operated 150mm dropper seatpost? We can confirm this will not be suitable for an internal routed cable but externally will be suitable. For options please take a look below We hope this helps! Hi. What kind of bearings are these wheels running on? Sealed bearing or cup and cone? The bearings in this hub are sealed bearings. Im 6ft 2, which size would you recommend as I'm between L and XL. I ride an XL pinnacle kapur 3 at the moment for reference. Also could you run a seatpost shim to fit a 30.9 dropper post? Thanks. we can confirm the L would be the suitable option and you can also run a dropper seat post We hope this helps!